In another act that has progressive shaking their collective heads in bewilderment, frustration and disappointment, President Obama is pushing Congressional approval of trade agreements with South Korea, Colombia and Panama that organized labor calls job killing measures. 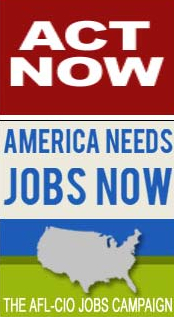 The AFL-CIO believes with 25 million Americans desperately looking for full-time work Congress should be spending its time on job-creating legislation like President Obama’s American Jobs Act, not job killing trade deals. 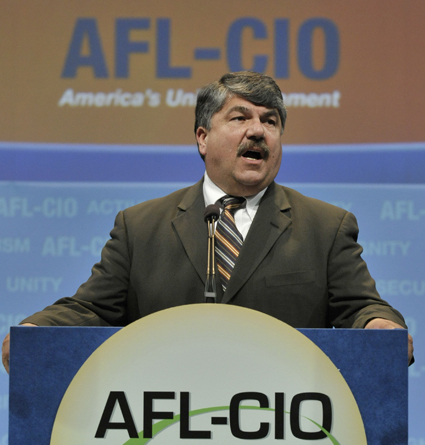 AFL-CIO President Richard Trumka has said the largest of the three trade pacts, with South Korea, will cost the U.S. 159,000 jobs. The deal with Colombia will cost 54,000 jobs, he said. The White House and Democratic leaders in Congress are also at odds over the trade deals. House Minority Leader Nancy Pelosi (D-Calif.), added her skepticism about the number of jobs that could be created by the trade deals. 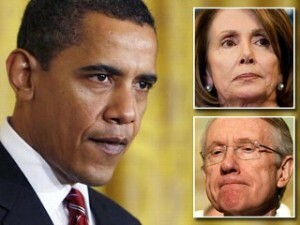 “The White House may support it, but the Congress may have a different view,” Pelosi said. Yet, lining up with Obama is Speaker John Boehner (R-Ohio) and Senate Minority Leader Mitch McConnell (R-Ky.) who strongly supports the pending trade deals. This, of course, has many progressives and Democrats scratching their heads and, once again, expressing total frustration with the President. • The South Korea agreement is the largest off-shoring deal of its kind since NAFTA. If enacted, it likely will displace 159,000 U.S. jobs, mostly in manufacturing. And its glaring loopholes would allow unscrupulous businesses to import illegally labeled goods from China and possible even from sweatshops in North Korea—potentially without any tariffs at all. • In Colombia, one trade unionist is murdered nearly every week and almost none of the murderers are brought to justice. In 2010, 51 trade unionists were assassinated in Colombia—more than in the rest of the world combined. So far in 2011, another 22 have been killed, despite Colombia’s heralded “Labor Action Plan.” Would we reward a country where 51 CEOs were killed last year? • And the Panama agreement has many of the problems of the other two deals, like deregulating big banks and letting foreign investors bypass U.S. health, safety labor and environmental laws. Panama is also a tax haven: a place where tax-dodging, money-laundering millionaires and billionaires hide their money. You can support the AFL-CIO’s effort to save jobs by ACTING TODAY and calling 1-800-718-1008 (or click here to e-mail) and tell Congress to stop the South Korea, Colombia and Panama trade deals that will destroy U.S. jobs and decimate American manufacturing—and give a virtual blank check to foreign governments to trample on the rights of workers. ← NYC Mayor Michael Bloomberg Tells Occupy Wall St. Protesters to Be Nicer to the Banks! The advantages of the President’s trade agreement moves with South Korea, Colombia should also be emphasized, which is not the case in this report, so that we can put it side-by-side the fear of possible job loss, which organized labor have maintained. By this we will have better understanding of the issue. Thanks all the same Larry.